Flight of the Filthy Vicar is the second installation in the Rustmonster book of projects. Like the first album, Last Voyage of the Black Betty, The Flight of the Filthy Vicar is a concept album that tells a story in three acts. The story begins with a pirate rotting in a cell, awaiting his sentence: hanging from the neck until dead. He proceeds to write down his memoirs. He plans to drop his finished manuscript to a pair of boys that visits often, gawking up at his cell, hoping to see a real pirate. The imprisoned pirate’s memoirs tell the story of how he joins a consortium of pirates with a plan to attack a Spanish flotilla off the coast of south America and steal their gold. At the climax of the story, a huge battle occurs between the pirates, led by the sordid Captain Sheldon Ire, and the Spanish. The pirates triumph, taking the gold and seizing the day. The narrator leaves the story incomplete with the allusion that the downfall of the pirate consortium comes from within. Rustmonster is currently working on the second half of the story. It will be found on their third, untitled as yet, album. Flight of the Filthy Vicar was an ambitious project. More than 20 musicians lent their talents to the final product. 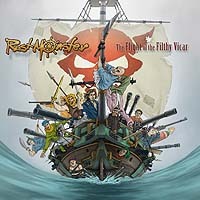 This album offers the same diversity in music and narrative experience that fans have come to expect from Rustmonster. Intrigued? Pick up a copy of Flight of the Filthy Vicar today. If you like it, feel free to drop us a line. We’d love to hear what you have to say.